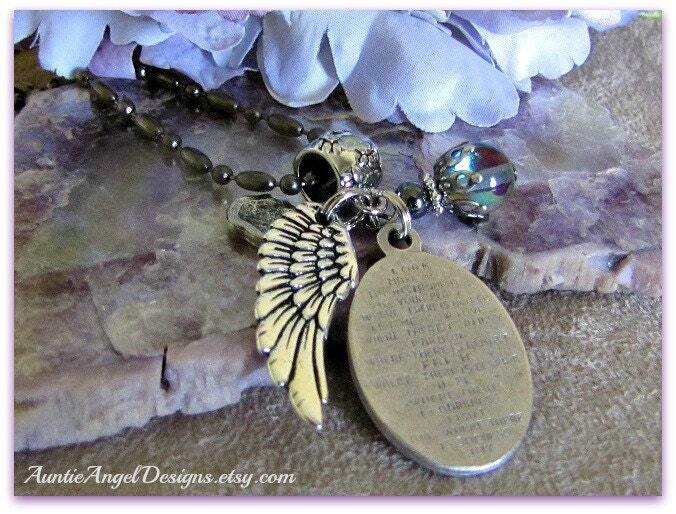 My "St. Francis Prayer Charm Necklace" is a devotional everyday piece of jewelry by Auntie Angel Designs as a tribute piece for many whose favorite saint is St. Francis of Assisi, the patron saint of animals and those who suffer. Many pet guardians pray to St. Francis for the health and welfare of their beloved pets. 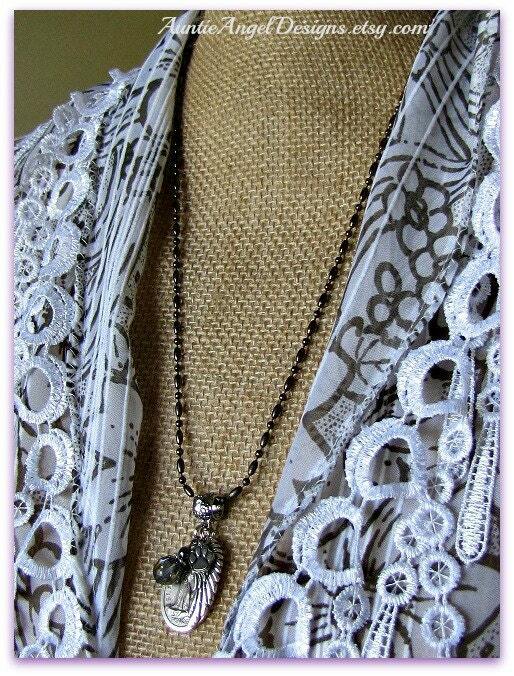 This necklace is made with a 24-inch high-quality gun-metal-finish dot-and-dash chain with lobster clasp, and its focal pendant is the lovely 1.2" Italian-made oxidized St. Francis Prayer medal dangling from an adorable silver-plated tiny paw prints charm bail. 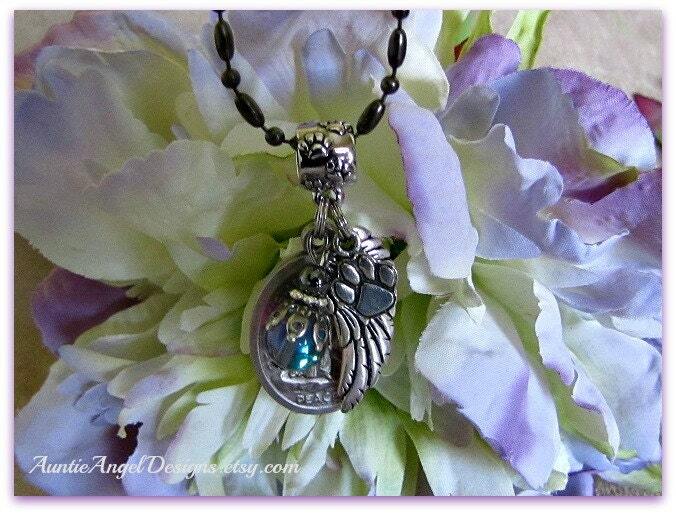 Alongside the holy medal is a pewter angel wing charm with a pewter paw print charm and a gorgeous flash-foil effect silver-ish blue bead dangle. "Lord, make me an instrument of your peace. Where there is hatred, let me sow love. Where there is injury, pardon. Where there is doubt, faith. Where there is despair, hope. Where there is darkness, light. And where there is sadness, joy." 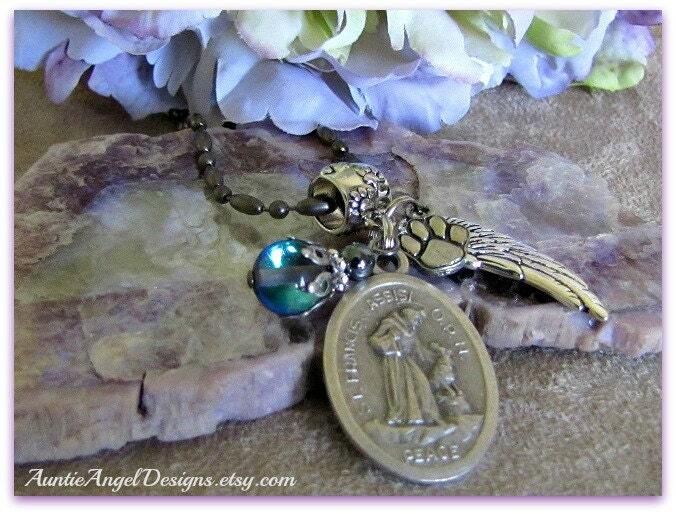 My "St. Francis Prayer Charm Necklace" comes beautifully gift-boxed with ribbon and is ready for gift giving. If I am sending this gift for you, please fill out Etsy gift message box with your message and "sign" your name to the message. Perfect. Beautifully packaged. My sister loved it. Beautiful item, great packaging & quick shipping too!